The Harvard Gazette summarized this research, which was featured in reports by the BBC, NPR, and many other news outlets around the world.Read the scientific paper here. Inspired by my mentors and colleagues at Northwestern, Drs. Emily Rogalski, Sandy Weintraub, and Marsel Mesulam, we have been conducting research on superaging since 2014. With my team co-directed by my colleague Dr. Lisa Feldman Barrett, we have been investigating adults in their 60s, 70s, and 80s who are able to perform memory tests as well as individuals in their 20s. We have found that they also perform well on tests of other kinds of abilities, and that parts of the brain that contribute to memory are "partially" or "fully" preserved. That is, they are either intermediate in size compared to typical older adults or similar in size to that of young adults. We are continuing to pursue this work to try to understand more about the brains of these remarkable individuals, and more about factors that might contribute to superaging. Ultimately, we would love to learn how to develop personalized programs to help us all become superagers! Since 2003, we have been performing studies seeking to understand the anatomic and physiologic basis of human memory in humans of ages across the lifespan from the 20s through the 80s. In one line of work, we are attempting to determine how the brain processes at work during the learning of new information enable individuals to spontaneously recall this material, and how these processes differ when individuals are able to recognize previously learned information but not spontaneously recall the material (e.g., why essay tests can be more difficult than multiple-choice tests). A special focus of these efforts is on high-resolution imaging of the medial temporal lobe memory system. We recently extended this work into functional MRI measures of spontaneous activity during quiet wakefulness (when a person is lying in the scanner not doing anything in particular). Our preliminary findings suggest that the degree to which different parts of the brain's memory circuits are "in synch" predicts how well a person will perform on a memory task administered in the next 10-20 minutes. Read more about this 'resting state' work here. In addition to the imaging work, we are pursuing behavioral investigations of a variety of aspects of human memory abilities, both from the perspective of how people organize, learn, remember, and use new information and how these processes fail in normal aging and in memory disorders. Intermittently since 1995 and continuously since 2002, studies have been underway in my laboratory to attempt to identify how anatomic and physiologic alterations relate to memory deficits in humans with memory disorders, such as Alzheimer's disease. Work in progress seeks to identify physiologic alterations in memory circuits in individuals with mild cognitive impairment (MCI) who may have the earliest changes in brain structure that are typical of Alzheimer's disease. One goal is to combine functional and structural measures to better identify individuals who would be good candidates for enrollment in clinical trials of treatments to slow the disease process. Since 1995, we have performed investigations to try to illuminate the alterations in brain structure associated with aging, mild cognitive impairment (MCI), and Alzheimer's disease. 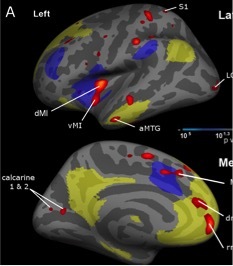 As part of this work, efforts are being made to attempt to understand the significance of normal variation in medial temporal lobe and neocortical anatomy, and how these differences relate to individual differences in memory, language, executive, visuospatial, and other abilities, as well as constitutional (genetic or environmental) factors. We are also interested in the relationships between anatomic alterations in aging and neurodegenerative diseases such as AD and FTD, and alterations in performance of cognitive and affective tasks. Since mid-2005, we have undertaken a collaborative development project with investigators in the Martinos Center for Biomedical Imaging and MIT, generously supported in part by the P41 NCRR resource grant, in which we are developing, validating, and applying methods for fMRI studies at resolutions as high as 1mm isotropic (3T) and 0.95mm isotropic (7T) and structural MRI studies at resolutions of 500um isotropic and 380um in-plane (3T and 7T). An essential part of these studies are the ultrahigh-resolution collaborative team (see "People"). Work is ongoing with local and distant collaborators to share methods as they are being developed. Since early 2007, we have been performing detailed studies using tools of neuropsychology and psychometrics as well as advanced MRI imaging to try to identify relationships between regions of focal neurodegeneration in various brain regions and difficulty performing specific types of behavioral tasks. We hope that these studies will help to illuminate fundamental aspects of brain anatomy and function and also to assist in the diagnosis and monitoring of these conditions (see non-Alzheimer dementias link above for further description of these conditions). Since 2003, we have been developing methods for quantifying the relative severity of symptoms in daily life and signs on performance-based and other testing that relate to behavioral changes in neurodegenerative disorders that affect cognition and behavior. We are attempting to learn more about the specific origins of behavioral changes (from both the clinical and cognitive neuroscientific perspectives), and also to try to translate these measures into clinically useful tools to assist in diagnosis, prognostication, and monitoring. We are always happy to discuss our research with people who would like to participate, be they volunteers for scanning, donors, students, post-docs, or collaborators. See 'How to participate' above for more details.